If you’re following other preppers and prepping sites on social media undoubtedly you have been asked which gun or knife you would choose if you could only choose one, along with which 5 items you would select if you were stranded on a desert island. As a continuation to my last post about the perfect backpack I wanted to talk about my choice and qualifications for choosing that one perfect knife. As I mentioned in my last blog post this is somewhat of a ridiculous practice, for the most part. Tools are usually made for a specific purpose so, to choose one tool for every job is not a good way to work. There are few situations that would limit you to having only one tool. It does, however, have some merits for learning and understanding. If you are a knife guy or gal you know how many different knives are available. There are thousands of knife makers and tens of thousands of knife designs. There are hundreds of different types of steel available too. Decisions can be difficult and a lot of time can be spent and wasted. To help minimize your wasted time,and take advantage of what I have learned I will try to keep this as short and concise as possible for you. And for me too because I just don’t write about enough topics as it is. A large knife can do much of what a small knife can but a small knife can not do what a large knife can. Thus, your orientation should be toward the largest knife possible but not too large that it can not do the work of a small knife. A large knife can chop but an axe is a much more of an efficient chopper so leave that work for an axe. But, a large knife CAN chop. It’s just not always it’s primary purpose, nor do I think it should be. There are so very many videos on YouTube demonstrating how well a particular knife can chop. Don’t waste too much time on them. Knives that are big enough to compete with an axe on chopping are too large to be that one all purpose knife. A saw is far more efficient than an axe. So, don’t bother chopping much at all. Carry a saw appropriate for the work you intend to do. I always carry a 210mm Silky saw. I never carry an axe on my go-bag unless I intend to build a structure or split a lot of firewood. Which is almost never. You will also find a lot of videos on YouTube about batoning with a knife. Again, don’t waste too much time on them. Knives are not meant for splitting wood so avoid it if you can. Bring an axe. In a survival situation it is likely that you won't need to do it. Use the twigs, branches, and logs you find on the ground. A large knife is essential though in helping you to process the wood you find into tinder and kindling if it is not easily found and especially if it has been raining and the only wood you can find is wet. There is no need to waste energy to cut firewood into appropriate sized logs in a survival situation when you could simply put the end of a long log on the fire and move it closer as it burns. Be smart and efficient and save your energy. What environment do you find yourself in the most? This will likely be the question that makes the most difference with your decisions. I live in a dry climate so I don’t really need to select a stainless type of steel. A high carbon steel is a better choice for a tough blade that is easy to sharpen but holds an edge well, can throw sparks using flint, and is cost conscious. There are a lot of very good steels available. My advice is not to get too wrapped up in selecting one. Each type of steel has its specific traits. Knife makers select the steel that they prefer for how the blade should be used. So, trust the knife maker with the purpose of how they have designed their knife, how they have shaped and heat treated it. That said, I will also say; stay away from cheap knives because their decision on selecting the steel is cost and not performance. Handle material is important as well as the steel you choose. If the knife is not comfortable in your hand it’s not going to fill your needs very well. Micarta is my favorite. It is a layered canvas material. It’s crazy tough and is easy to hold onto when wet or otherwise slippery. G-10, Kraton, and other polymers can be great too. It all comes down to what feels good in your hand so hopefully you have a great local knife shop like I do and can go put your sweaty hands on a bunch of knives. Bladehq.com is where I go as they are local to me. Again, a quality knife maker will choose the handle material, or scales as they are often called, according to their experience, expertise, and knife design. Let’s talk blade thickness for a minute. 1/8”, 3/16” and 1/4” steel thickness is what you will see the most with blade thickness on large knives between .11 to .25 common. All of these decimal thicknesses are slight variations of these three measurement, give or take. You can typically do a wider variety of tasks more easily with a thinner steel although you will still need to use it appropriately. The type of intended use also depends upon the "grind" of the blade. The type of edge the knife maker has chosen to put on it. A Scandi grind blade is great for more of the fine woodworking tasks but is not typically strong enough to baton with. A flat grind is an overall good performing edge for lots of tasks. A convex grind provides for a more durable edge for chopping but is not good at smaller task. A hollow grind makes for a very sharp edge but it can be more fragile. There are many other versions of grinds that a maker will prefer to give their knife for it's intended purpose. I have developed some brand loyalties. Brands that I keep coming back to regardless of how much I research... Or rather, in spite of or because of how much I research just turns me back to those brands. 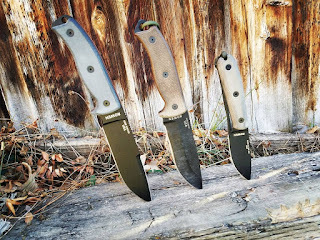 One of these brand is ESEE. Randall Adventure Training. Knives made by Rowen; 1095 steel and Micarta “scales” as they are referred to, have become my favorite for all of the reasons I have already listed. These are not flashy knives but are practical and functional with a lifetime unconditional warranty made for hard use. But just like any tool if you use it for other than it’s intended purpose you could break or damage it. So, if I were to choose just one knife, and I have made that choice, I would, and have chosen the ESEE 5. Allow me to elaborate. The ESEE 5 is a 5” long, 1/4” thick beast of a knife. Yes a longer knife would chop better but that’s not what I use it for most. Yes a thinner knife would process fish and carve wood shaving better, but that is not what I use it for the most. It has been said that you should bring the most gun you can to a gun fight. I follow a similar practice with choosing a knife. Bring the most (not necessarily the biggest) knife you can to your survival situation. 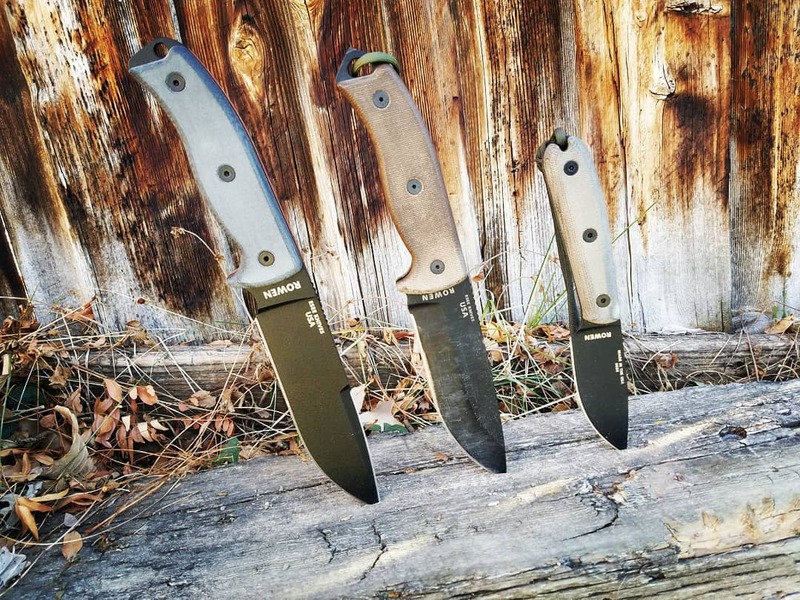 Some may say that because the ESEE 5 is good at most everything that it doesn't do anything in particular very well. It's not really big but it's not that small either. It's really thick so it can hold up to some serious batoning but it's too thick to clean a fish without some difficulty and if it's not really sharp. It has a partial flat grind called a saber grind which provides some of the benefits of a Scandi grind and some of the benefits of a full flat grind. So that would mean that it can't do what either of these grinds can do particularly well. These are all reasons why this knife works best for me. It can do most everything which is what I need from a one tool solution. The ESEE 5 was also designed with the urban environment in mind as it comes with a glass breaker at the end of the handle. A thick knife can also be used for some prying or demoing if necessary to assist with entering or exiting a building. With shelter being the #1 consideration in a survival situation this is a tool that will do better than other survival knives in an urban environment. Because I find myself in urban and suburban areas far more often than the wilderness that makes this knife a smarter option for me. To summarize: A saw is more efficient than an axe at cutting down logs to size. An axe is far more efficient than a large knife at chopping or splitting but it is heavy. A large knife can do all of these tasks just not particularly well comparatively. However, all of these tasks may not be necessary in a survival situation. Traveling light and fast is a high priority to me. So I carry a small saw and a large knife but not an axe. Thus selecting the right large knife for me was and is my #1 priority. If there was only one thing I could grab in a survival situation, in addition to the EDC items I always have on me, it would be this large knife. As I learn and experience more I just may change my priorities and opinions. I would love to hear about your opinion and experience on this topic. Shane Coles, thanks so much for the post.Much thanks again. Really Cool. So you want to put together a 72 hour kit? Shane Coles on Where do we go from here? Shane Coles on So you want to put together a 72 hour kit?